Posted 3/9/2011 8:20pm by Miranda Combs. ...but please remember to call in by Thursday evenings to reserve any item you are counting on buying! A one minute call can make things easy for you! Chickens, beef and pork are available every week, but it does not hurt to call orders in advance, especially if you can not make it to the market early on Saturday. Orders can be made via phone. Please call in all orders to the farm at 724-898-2316. The Kennedy's take orders 9 am to 9 pm Monday through Thursday, and 9 am to 6 pm on Fridays. Posted 3/3/2011 10:18pm by Miranda Combs. The market will be open this Saturday as usual. We should have a full compliment of farmers and other vendors on Saturday. One thing you will notice when you visit the market is that we have successfully demolished the temporary building in the parking lot. This is a seminal event for the market as the building was not very attractive and took up a large part of the parking lot. Many of you may remember that the temporary building was erected when a fire gutted the market in February of 2007. This is a remarkable story because the fire was on a Monday night, and the farmers quickly pulled together and worked to get the temporary building up in 5 days. The market opened on Saturday as usual. The market did not miss a single Saturday of business! Check out some newspaper coverage from back then. In addition to opening up the lot for more parking, tearing down the temporary building reveals a really nice mural is was painted on the side of the building. So please come to the market this Saturday and support your local farmers. Also, please see information below on a really cool upcoming food event- The Local Food Showcase- March 10th at Chatham University. Please check it out. 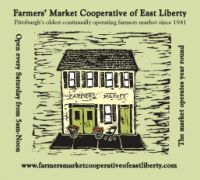 This event showcases the finest, freshest local food western PA has to offer. Farmers and food purchasers will interact to find new business connections for the upcoming growing season and beyond. Come join other producers at the premier grower/buyer networking event in the SW Pennsylvania region. Find customers for your farm products by registering as a vendor! "Pricing Techniques and Marketing Strategies to Increase Sales." Learn about different pricing techniques adopted by the food industry. A lecture and discussion of marketing strategies used to increase sales via direct and indirect channels rounds out this workshop. This networking event is the heart of the program. Register to represent your farm or food business at a table. Information and samples of your products will show buyers looking to do business what is available to showcase in restaurants, stores, farmers markets, etc. Over 300 buyers attended in 2010.
benefitting more of our neighbors and their businesses. Consumers are making purchases based on concerns about food safety, nutrition, environmental sustainability and local economies. Additional benefits include a reduction in the amount of miles food travels, thereby reducing the amount of greenhouse gas emissions. growing steadily over the past decade. Please visit our website. You can sign up for a weekly email update. Please forward to friends who may be interested in the market. Posted 3/2/2011 9:22pm by Miranda Combs. For those of you who missed it, please check out the New York Times article from last weekend that discussed the growing local food movement in Pittsburgh. Although it did not mention our market, it highlighted locally grown offerings at several of my favorite restaurants- Salt of the Earth, Legume, Habitat and Elements. Trevett Hooper, chef and owner of Legume, is a regular customer at the Farmers Market Coop of East Liberty and buys his chickens from the J.L. Kennedy Meat Stand! So please follow Trevett's example and buy your meat from the Kennedy's. Special note to our customers- please remember to pick up all orders by 10:30 am on Saturday! We have kept that rule now for 10 years, and it allows us to have the meat out of our cases and coolers in order for proper clean-up. We will try our best to hold the orders if you run into problems and are running late... BUT...please call the stand # (412-661-1875) so that we KNOW you are running late !! Posted 3/2/2011 9:11pm by Miranda Combs. Posted 2/24/2011 7:27pm by Miranda Combs. The market will be open this Saturday as usual. We should have a full compliment of farmers and other vendors on Saturday. I got an update this week from Judith Odili who makes the Earthen Springs Naturals products. I would like to share the information on her products which are available exclusively at the market. Also, please see information at the bottom of this message on a really cool upcoming food event- The Local Food Showcase- March 10th at Chatham University. Please check it out. Beautiful skin and hair can be achieved using products made without the help of scientists. Earthen Springs products are a luxurious blend of the finest butters and essential oils in the world, whipped to perfection to ensure easy applicability. All the products are 100% natural, and homemade - no artificial preservatives or fragrances are used. Many of the ingredients are imported from small manufacturers in West Africa, and the most of the oils used are organic. Shea Cocoa Lip Balm: This is an all natural lip balm comprised entirely of rich oils and butters. It is an all natural way to heal and protect your lips from the weather, sunburn and other conditions. Best if all, it only costs $1. Ingredients: Organic Beeswax, Shea Butter, Cocoa Butter, Mango Butter, Coconut Oil, Sweet Almond Oil, Avocado Oil, Vitamin E Oil, Essential Oils of Peppermint, and Sweet Orange. Hair and body butter: Why buy two products for your hair and skin when you can buy one? Shea, Cocoa, Mango and Cupuacu butters have been used for centuries in Africa and South America to protect and moisturize the skin. You will feel truly pampered each time you use this butter and we can guarantee that you’ll fall head over heels in love with your skin. Ingredients: Mango Butter, Shea Butter, Cocoa Butter, Coconut Oil, Cupuacu butter, Jojoba oil, Grapeseed Oil, Sweet Almond Oil, Avocado Oil, Evening Primrose Oil, , Vitamin E Oil, Essential Oils of Sweet Orange, and Tea Tree. Repairing Hair Oil: This Repairing Hair Oil protects your hair from heat damages, weather changes and environmental issues, and keeps your hair soft and shiny. Can be used on the skin as well. Ingredients: Castor Oil, Olive Oil, Coconut Oil, Jojoba Oil, Vitamin E Oil, Essential Oils of Neroli, Rosemary, Tea Tree, Peppermint and Texas Cedarwood. Liquid and Soft Black Soap: The leaves and bark of the various plants and trees are shredded and put into a metal vat or cooking kettle and burned until all that is left is ash. The ash is then mixed with water and is mixed with oils or butters to create the soap. Many people use it as a skin enhancing cleanser because it is reported to reduce cracked skin, acne, wrinkles and fine lines. Overall, black soap is a deep pore all natural cleansing soap crafted using a process developed centuries ago in ancient Africa. Posted 2/23/2011 8:08pm by Miranda Combs. Posted 2/16/2011 10:00pm by Miranda Combs. Please visit our website. You can sign up for a weekly email update. Posted 2/10/2011 9:00pm by Miranda Combs. The market will be open this Saturday as usual. Please check out the nice article in the Post-Gazette that Food Writer Miriam Rubin wrote about eating vegetables in the winter. I love the title- "Snow's no excuse for not eating your veggies." I certainly agree! She mentions the market and highlights some of the locally grown products that are still available. Check out the artwork which was painted by her husband David Lesako. Please stop by the market this Saturday. Posted 2/9/2011 10:08pm by Miranda Combs. Now that the market has a functioning website, we are merging the email distribution lists of the Kennedy Farm Family Meat Stand with the overall list for the market. In general, we plan to send out 2 emails each week. One on Wednesday evening to highlight the meat specials for the week. This will give people some time (Thursday and Friday) to call in orders to ensure that they get the items they would like on Saturday. We also will send out a message on Thursday evening to highlight some of the special events and items offered by the other farmers and vendors. We hope these updates are helpful to you. We are always open to suggestions that our customers have, so please let us know. You can post comments to the blog on the website or just send us an email. Fresh local lamb- this is an incredible product, and is available only periodically. A variety of cuts are still available. Posted 1/27/2011 10:08pm by Miranda Combs. Some people have been asking me recently whether there really are locally grown items still available at the market. The answer is yes. So last week I polled all the farmers and vendors to come up with a list of specific items. I provide a summary below. Of course their specialty is locally grown eggs, which are still available. They also have locally grown squashes, 5 different varieties including spaghetti cooking pumpkins, and acorn. These have been stored from the fall and will only be available for a few more weeks. Please order via phone only* Please call all orders in to the farm #724-898-2316, from 9am—9pm on Mon-Fri. The Saturday stand # is 412-661-1875. They have a lamb day and a veal day coming up. Both are exceptional probucts. They will have 6 to 8 varieties of fresh locally grown apples (from their farm in Armstrong County). Saturday they had Macintosh, Matso\Crispin, Empire, Jonagold, Red and Golden Delicious and Fuji. They also have fresh pressed cider that is made with a variety of apples. This is the best cider available in Pittsburgh, in my humble opinion. Tim Hileman, the owner of Kistaco said the apples and cider will be available for many weeks to come. Tim also makes homemade all natural peanut butters. He will be providing free samples this Saturday. Pennsylvania mushrooms, several varieties- crimimi, shitake, yellow oyster, portabello and of course white button. Although these same varieties may be available at some grocery stores, these are guaranteed to be very fresh, which is important for mushrooms. They are also offered at very reasonable prices. Shallots, one that Rick personally grows and boy are they good. I only discovered shallots a few years ago and they have really expanded my cooking. Celeriac- very interesting looking veggie, I am seeing on the menus of more and more fancy restaurants. Rick also grow potted flowers in his greenhouse, and he brings those in throughout the winter. They can certainly brighten up a dreary winter day. The goat cheese that Sam and Susie Byler make up in Clarion County is excellent. We have several kinds of fresh chevre and a very good goat milk feta. Many people who sign up for CSAs get it in there boxes throughout the summer, but we are one of the only locations to sell it through the winter. We also have many other vendors that offer locally made food and prepared items. Please click on the web site for more details. Please don't let the cold weather stop you from coming to market. We will be there until 12 noon on Saturday. Hot chocolate and hot coffee will be available.